Introduction: The inverter is suitable for battery powering of mains appliances. It is a switching converter, which contains no bulky, heavy and expensive iron transformer. The advantage of small size and weight, precise output voltage stabilization and among other things, very little quiescent power consumption, which can not be achieved using the classical transformer. The disadvantage is perhaps it is a little more complicated :). Use: Can be used for most appliances except those capacitive (eg. with high parallel capacitor) and those that require pure sine for another reason. Not suitable for capacitive limited mini fluorescent nigth lights and LED light bulbs. For the conventional fluorescent (or discharge) lights is necessary to disconnect the capacitor. Circuit description: Switching Inverter with modified sine wave typically consists of two parts: 1) DC/DC converter that increases the DC input voltage of 12V (24V, 48V) to the high DC voltage corresponding to about the mains voltage amplitude (for mains 230V~ it is 325V=) and 2) polarity switching bridge that turns this increased voltage into a modified sine wave. For lower output power switching converters (up to about 150W) the DC/DC converter can be built as flyback supply. For more power would be necessary to use a push-pull supply (or forward, but the complication is very high secondary voltage). Single coil step-up inverter is not suitable, because the step-up ratio is too large. 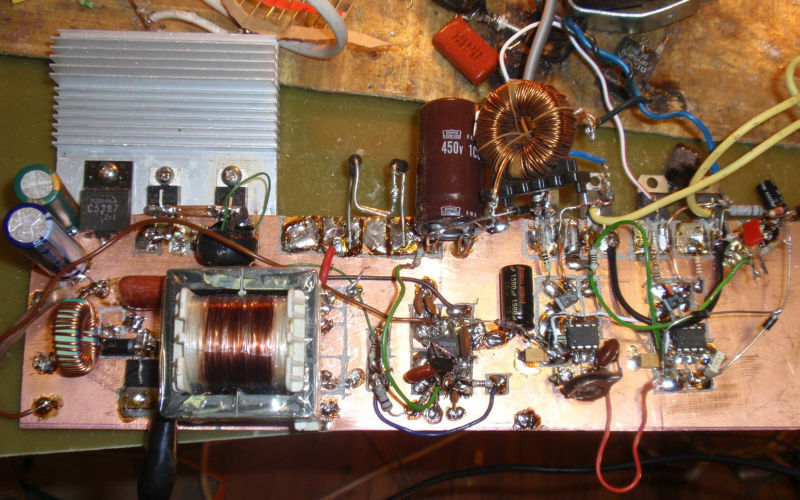 Due to the low power I have my DC/DC converter finally built as flyback supply. I will omit the detailed description of the DC/DC section, because this schematic has already been described in detail here: DC/DC converter 12V / 325V 150W. The inverter bridge is composed of the transistors of MOSFET N type: T3, T4, T5 and T6 . They are controlled by integrated circuits IO2 and IO3 of type IR2153. 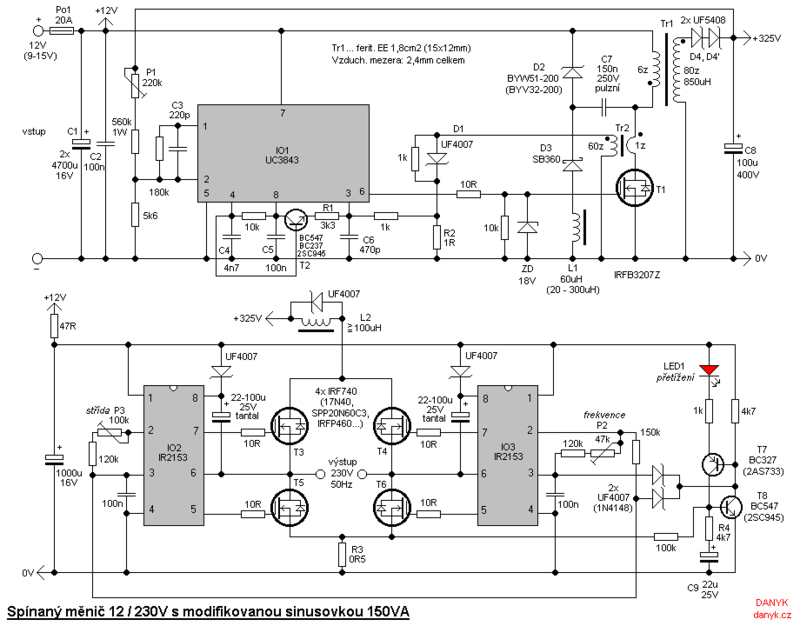 The circuit IR2153 is an integrated halfbridge driver with internal oscillator. IO3 oscillator works here as a master oscillator frequency 50 Hz. IO2 is a slave, its oscillator section is used as a phase shifter, depending on IO3. To make a modified sine wave bridge that could manage inductive loads, it is necessary to block (short circuit) the output while the zero output voltage. 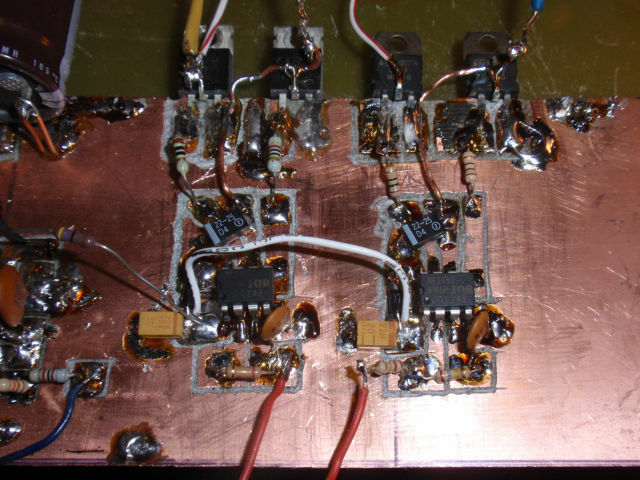 It is done by switching two transistors in the bridge - either both lower or both upper. For even distribution of losses it is obviously once the top and once the bottom pair. The best way to do this is using two rectangular singals with a phase shift. When the input voltage is 325V, the 230V rms output voltage is achieved with 90° shift, which is 25% duty cycle. Sometimes in the converters, another compromise is selected, eg 30% duty cycle with the input voltage 297V, or 33.3% with the input voltage 282V. DC/DC converter is set by the trimmer P1. DC/DC converter is recommended to be tested and adjusted independently. If we chose a 25% duty cycle, set P1 so that the output of DC/DC converter was 325V. P2 sets the output frequency. We measure the frequency of the IO3 pin 2 and set to 50Hz (for some countries it is 60Hz - I recommend to replace the 120k resistor by 100k it case of 60Hz). Finally, use P3 to set the correct duty cycle. Warning - voltmeters (multimeters), which can not measure the effective (RMS) value of the voltage at the inverter output will not show correctly 230V, but a little less! Therefore, they are not suitable to set the duty cycle! Actual voltage would be higher than the measured! The inverter is protected against overload and short circuit. 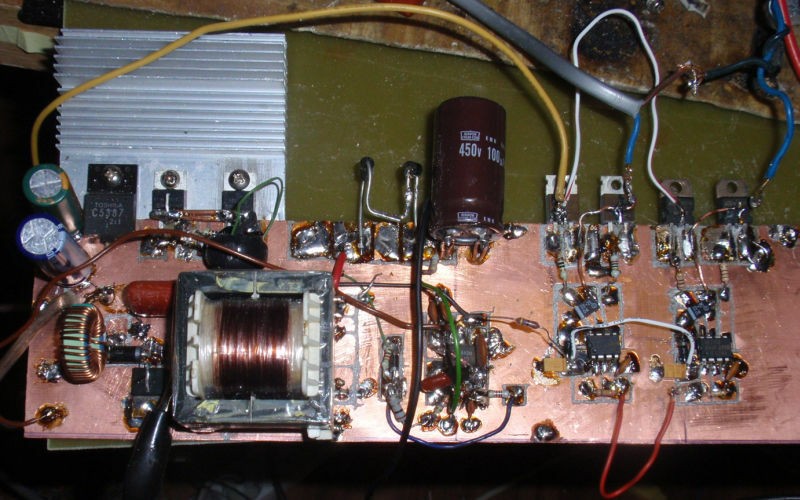 The current through the bridge is sensed by R3 shunt and T7 transistor. If an overload or short circuit, the T7 and T8 subsequently turns on. T7 to T8 keep each other open. They bring negative voltage on pins 3 of IO2 and IO3, which activates the shutdown (SD) and the bridge will remain off until disconnecting and reconnecting input power of the inverter. Given that most appliances creates a power surge when switched on, it is necessary to delay the protection, otherwise it will keep shut down. The delay is ensured by C9 capacitor. Thus the inverter can be short term overload without protection activating. In case of real short circuit the inverter but must be able to turn off quickly. The current threshold of the fast shutdown is much higher than the one of delayed shutdown and is set using R4. R3 determines the threshold of the delayed shutdown. L2 is used to limit the dv/dt in case of short circuit. Without it, the protection would only protect against overload, but not against short circuit. Under normal circumstances, the voltage on L2 is negligible. Activation of protection is indicated by LED1. Inverter efficiency is over 90%. Note: For 220V~ mains the amplitude is 310V, for 240V~ mains the amplitude is 340V. Warning! The inverter must be protected by a suitable fuse. Although the input voltage of the inverter is safe, its output voltage is mortally dangerous. Capacitors of switching inverter can remain charged to dangerous voltages even after shutdown. The inverter can be inappropriate for some appliances. Everything you do on your own risk. For any your harm I do not take responsibility. Circuit schematic diagram of switching DC/AC inverter (inverter without transformer) 12V / 230V 150W with modified sine wave. Inverter output voltage at the 25% duty cycle compared to the sine wave. Bridge (still missing current protection). Drive with hacked together protection, still in the "flying joints :)"
Video - testing of the homemade switching DC/AC inverter (background sound does not come from the inverter, but from a laboratory supply).